The relation between Taizé and mainland China goes back almost twenty years. Originally, one of the brothers of the community who is Chinese made a series of visits to seminaries that had reopened during the 1980’s. 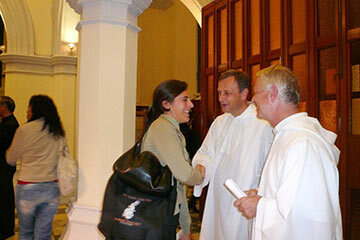 He got to know many of the seminarians and they kept in touch with each other. The community was keen to support the ministry among the young through their prayer and songs. Through the years, prayer in the style of Taizé has spread to many places in China. Today, even in isolated villages religious sisters lead prayer with the songs of Taizé; the songs are of course sung in Chinese and in this way they accompany both old and young believers. For a number of years, the community in France has welcomed bishops, priests, seminarians and sisters from China. In recent years, groups of pilgrims from China have also been coming to Taizé. Similarly, young Chinese, with a commitment in the Church, are invited by the community to spend three months in summer taking part in the international meetings in Taizé. During their stay, they live close to the community, with young adults from every continent, taking part the life of prayer and sharing, in great simplicity and openness. In this way, they broaden their perspectives and have an experience of the universal church. When they return to China after their stay, they are encouraged to commit themselves further in their local church. Taizé also welcomes young Chinese living in Europe, either individually or in groups, to take part in the international meetings. In January this year more than a dozen provinces in the South of China were struck by the most severe snowstorm for a century. The snowstorm was followed by persistent freezing temperatures. Two Chinese organizations, the Catholic Church based “Jinde Charities” in Shijiazhuang, and the Protestant “Amity Foundation” in Nanjing, were involved in relief work. Taizé contacted them in mid-February. Since brothers of the community had visited Jinde and Amity two years ago, collaboration was established very quickly. Before Easter, together with Caritas Germany, Taizé’s Operation Hope provided support for Jinde Charities’ relief work in Guizhou province, coordinated by the local bishop and financed also by local donations and Jinde’s own funds. Based on suggestions from disaster victims, local government officials, and local Church partners, the Jinde Relief Team offered emergency aid to 10,000 people in three remote villages where no outside help had so far reached. The aid included food supplies, seeds and fertilizer for replanting suitable crops, and material for repair and reconstruction of the damaged and destroyed houses. Operation Hope’s other target was the city of Changde in Hunan province. Through the Amity Foundation, the biggest Christian NGO in China, and the Hunan Christian Council, the aid from Taizé enabled families whose houses had collapsed under the heavy snow to construct very simple replacement accommodation. May 2008: These last weeks have been overshadowed by the grave news from Myanmar and China. As Brother Alois said in one of his Saturday evening meditations, “In the face of situations of suffering close to us or far away, we cannot remain indifferent.” We want to try to be close to these people, both now and in the future, when everyone’s attention has moved on to other news. In both these countries, sorely afflicted by the cyclone and the earthquake, brothers were visiting Christian communities just a few weeks ago. The communion with those who have been affected has only been increased by what has happened. Our solidarity has been expressed in a practical way by humanitarian aid sent by Operation Hope to two non-governmental organizations in China: Jinde Charities and the Amity Foundation who are involved in relief activity in the disaster area. (According to Xinde, the Chinese Catholic newspaper, this was the first humanitarian aid to arrive from abroad). This spring, these two important NGOs, whose social activity is Christian inspired, already collaborated with Taizé following the natural disaster that occurred in the South of China and they remain in close contact with us. “Together with young people of all continents gathered together on our hill of Taizé, we pray today for China, this country well beloved by us all. God, our hope, pour out your compassion on all those who are going through the great trial of the earthquake in China. When we are disconcerted by the incomprehensible suffering of the innocent, enable us to be witnesses to the gospel by our lives and to make the consolation of your Holy Spirit more visible. You want neither human distress nor misfortune on earth, and your love for each of us will never fade away. We entrust the Christians in China to you: support them by the continual presence of your Holy Spirit. 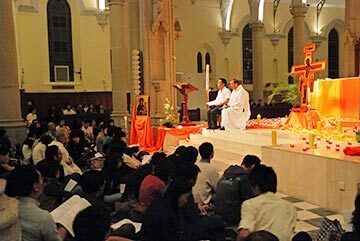 On Tuesday evening 13 November 2007 Christians of different denominations came together for prayer in Immaculate Conception Cathedral, Hong Kong. At midday the same day, there was a gathering at St John’s Anglican Cathedral, for those who work in the centre of Hong Kong. Brother Alois and other brothers of Taizé took part in both of these events. “The leader of the France-based Taizé religious community who is visiting Hong Kong has praised the faith of Chinese Christians but at the same time warned against certain negative effects of China’s rapid economic development. ‘In China there is a long tradition, a very ancient civilisation, in which the gospel has been able to find an echo and an underlying meaning,’ Brother Alois, prior of the Taizé Community, told more than 700 Christians at an ecumenical prayer meeting at Hong Kong’s Roman Catholic Cathedral. At the same time, however, he warned against some of the consequences of China’s rapid economic and technological development. ‘If these innovations bear within them many promises for the future, they must not make us forget what is essential,’ he said.” Ecumenical News International 14 nov 07. Every month, St John’s, the Anglican Cathedral of Hong Kong, welcomes Christians who work in “Central”, the financial district. During the mid day break, they come together to meet and listen to a guest. Knowing that Brother Alois was coming to Hong Kong, the “Christians in Central” group invited him to join them and, judging by the questions that were put to him, the meeting aroused much interest in a very warm atmosphere. The Archbishop, the Most Revd Paul Kwong, took part in the meeting. “It is a great joy to come to pray with you in Hong Kong. Our Brother Roger, the founder of our community, came here thirty years ago. He lived for several weeks in a shack, beside the sea at Aberdeen, sharing the life of the poor people living on the junks, not far from the Little Sisters of Jesus. Since then, some of my brothers have lived as a small fraternity in Taipo. Others have come back frequently to Hong Kong. They have also visited Christians in mainland China, who are so present in the prayer of our Community. 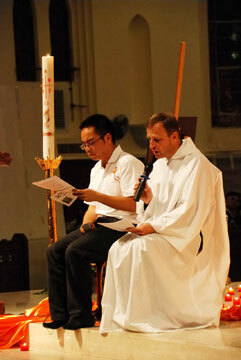 And young people from Hong Kong come to Taizé on pilgrimage.” Brother Alois on the evening of 13 November. The Bishop of Hong Kong, Cardinal Zen, was present for the prayer. This was a very joyful occasion, not least because it gave an opportunity for Christians of different churches to work together, especially Catholics and Anglicans. For several months prior to the 13 November gatherings, there had been a series of prayers in churches of different denominations. “When we heard that the pilgrimage of trust was to visit Hong Kong, we were all thrilled. To prepare for the prayer on 13 November, our choir members and the young people from the prayer group, in communion with brothers and sisters of other protestant churches had a series of prayer meetings with practices and rehearsal of songs. This is the first stage of communion in Christ.” Eleonor Lam, of the Catholic Cathedral. The next day, Brother Alois was eager to go on pilgrimage to the places where Brother Roger and the others - with a team of young adults from every continent - had stayed beside the South China Sea in November 1977. Even if the neighbourhood has now completely changed and the shack has long since been replaced by high rise buildings, it was possible by boat to get a glimpse of how Aberdeen was then, filled with junks with refugees from continental China. Later, a visit to the Holy Spirit Study Centre gave an insight into China today. Headed by Bishop John Tong Hon, the centre is made up of priests, sisters, laypeople, and professionals doing in depth research on China, particularly in what concerns the life of Christians there. The centre has become a reference for people seeking to understand the reality of modern China.